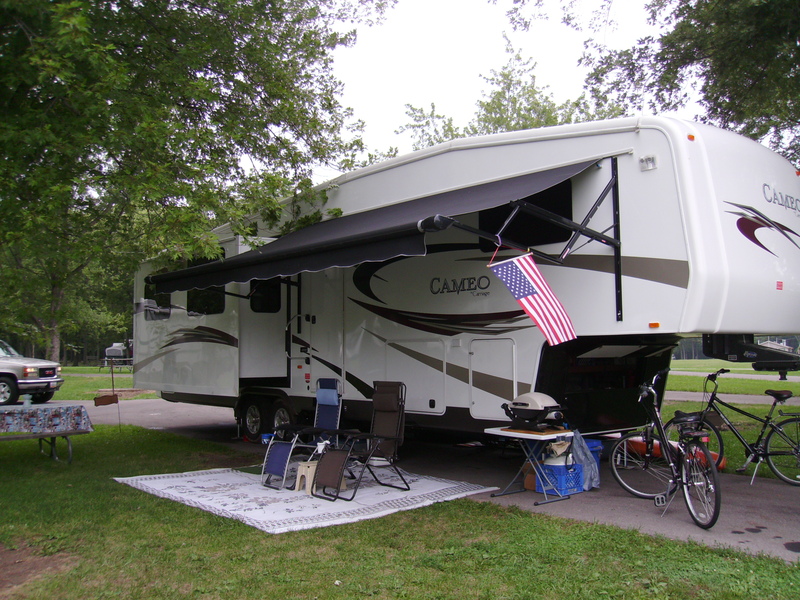 When deciding whether to go with a motor home or fifth wheel trailer we settled on a fifth wheel for a variety of reasons. 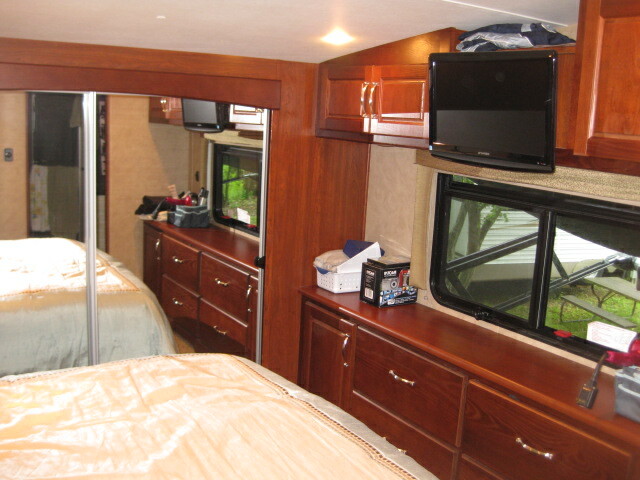 We felt you got more floor space for your money with a fifth wheel and if you have an engine problem in a motor home you lose your bedroom along with your transportation. The compartment under the fifth wheel pin in the front face of the trailer is what we call the “garage” as it holds most of our tools. The compartment under the bedroom is the largest pass-through storage and we call it the “basement.” As you can see, we use every bit of the space! 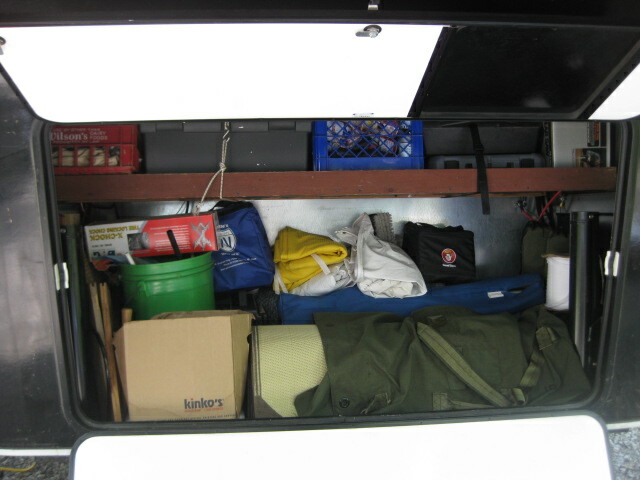 The rear pass through compartment is primarily for recreational equipment such as tents, sleeping bags, snorkeling/SCUBA gear and kayaking equipment. The bedroom has a full width closet with mirror panels, a dresser along the doorside wall with the second TV mounted on the wall. The bathroom is off the bedroom with separate entrances from the bedroom and living room. 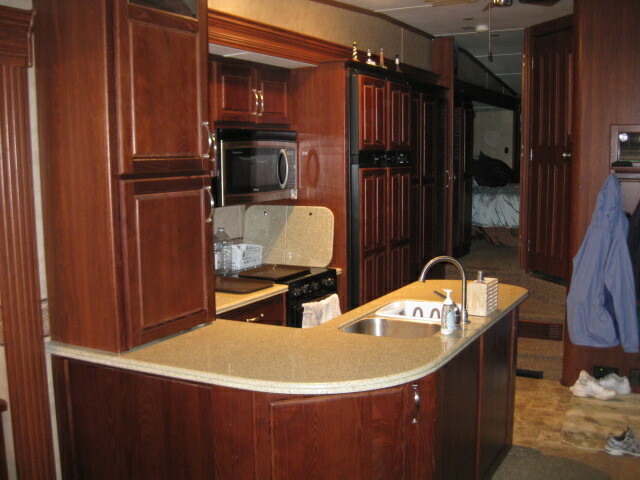 The kitchen is mounted in the center of the trailer and has a counter that extends into the dining area. We have a double refrigerator/freezer with a pantry to the right. A combination microwave/convection oven is mounted above the three burner range and gas oven. We have a double sink and a Corian counter top. The free standing table has an extra leaf and is much better than a booth as it gives you more flexibility. Two of the four chairs are folding chairs so they can be set aside when there is only the two of us. One of our requirements was to have a location for a small office area. Bob still planned to continue his business and it would be a good place for paying bills, etc. 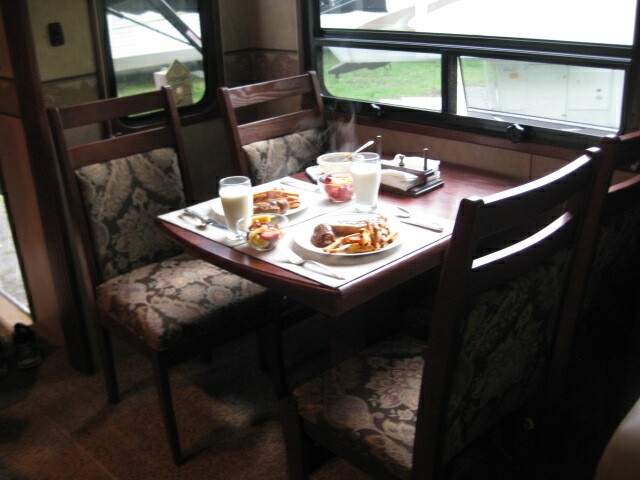 When we bought the trailer and saw it had an electric fireplace we thought it would not be used much, if at all. However, we found it to be very nice in December and January to take the morning chill off the room. If all you want is fire with no heat, you can only see the picture of the fire with no heat! 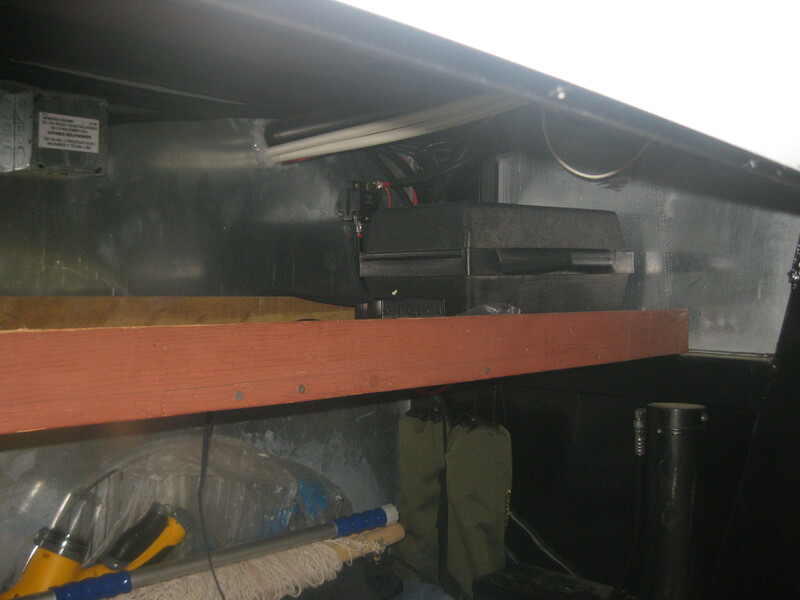 Our trailer is equipped with the Bigfoot leveling system. 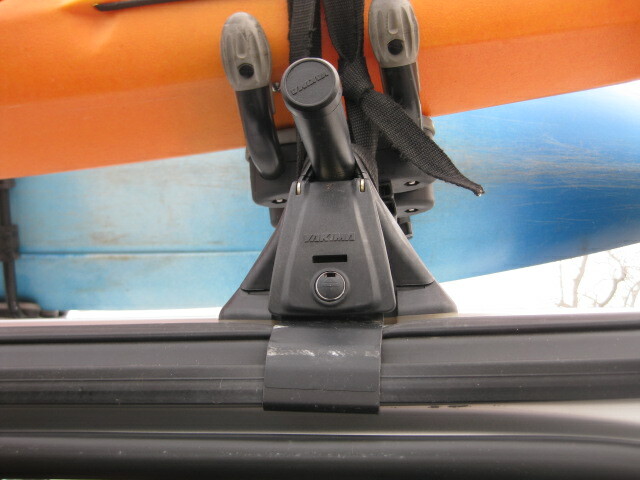 This allows us to level the trailer with the touch of a button. The Bigfoot system extends the stabilizing jacks and automatically makes adjustments until it senses the trailer level. Once we had purchased our trailer, then we had to find the right truck. We were surprised just how uninformed car salesmen seemed to be when we got into specifics on this kind of pickup, and we found that we were often more informed then they were. It is important that you do your own research, because as we found, you can’t count on good advice from the dealers. After much research and posting our problem on several RV forums, we decided on the GMC Sierra 3500 with a crew cab and dual rear wheels. You can’t get a bigger truck and still have a pickup! 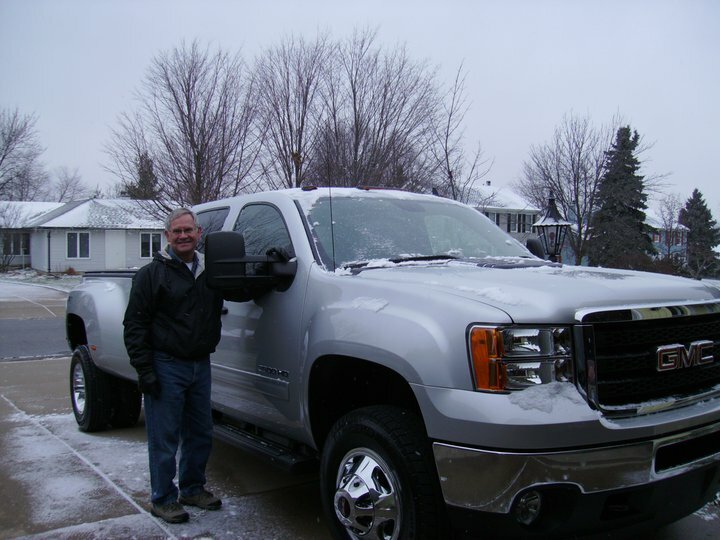 We wanted the crew cab so we could take other people (friends and family, especially our granddaughters) with us and they would have enough legroom. When you get a truck this big, it comes only with a long cargo bed. 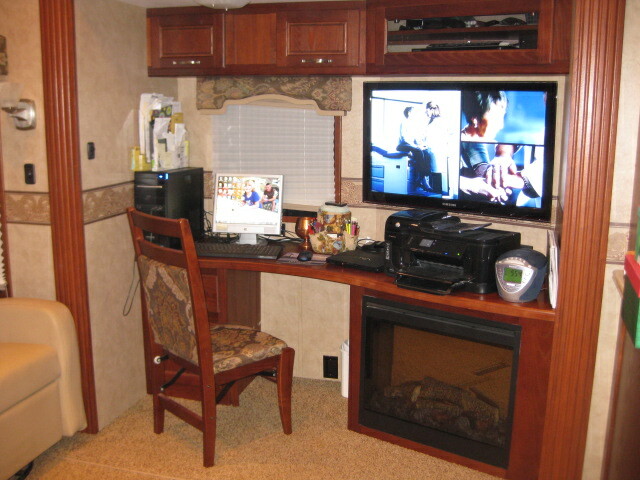 This eliminated the need for a sliding fifth wheel hitch. 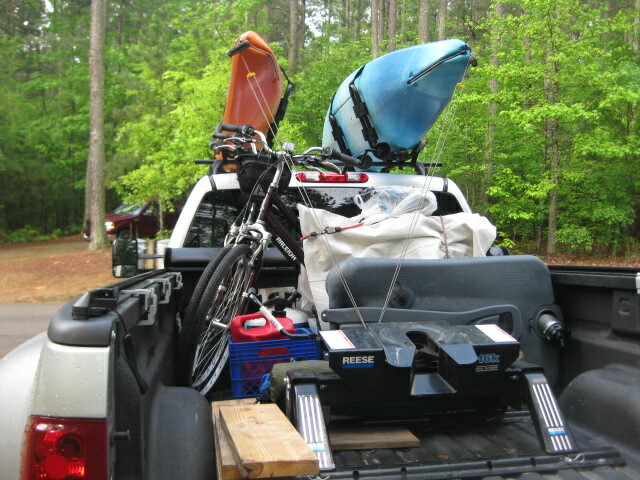 The large cab and long bed gave us enough room for our two 11 ½ foot kayaks. 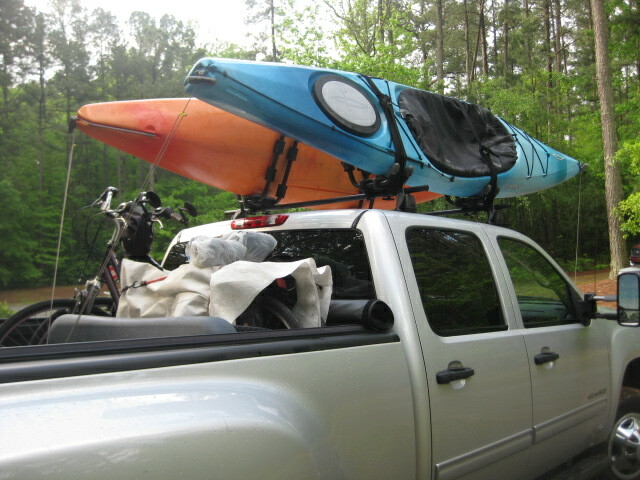 One of the challenges we faced in our early planning was, “What do we do with our kayaks?” At first it didn’t appear that we would be able to put them on the roof of the pickup because the trailer would extend too far into the bed of the pickup to leave room for them. However, after taking some measurements it appeared to be possible. Yakima is one of the biggest makers of car top racks, so we went to Yakima.com and they have a feature that allows you to enter the specifications of your vehicle and what you want to carry into an application on their website and Yakima will show you what you need for a rack. 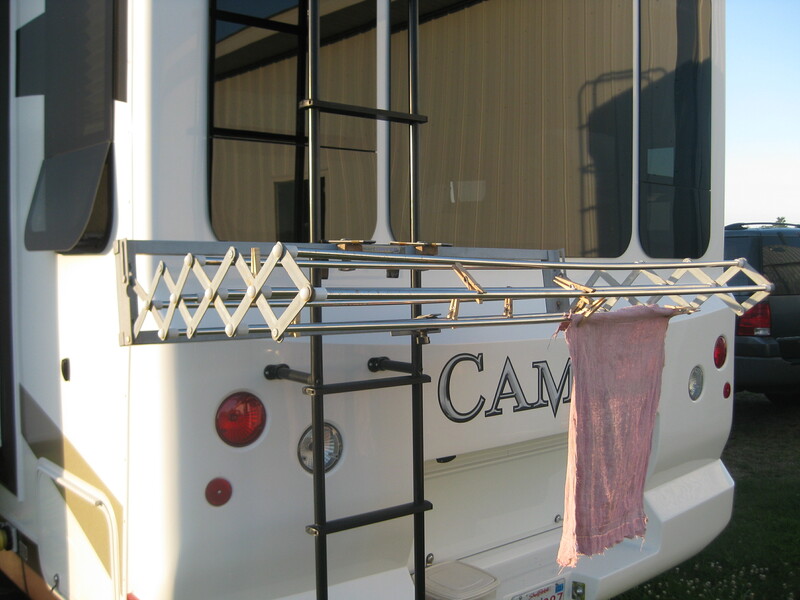 We then went to Campmor.com, one of the biggest discount stores for outdoor equipment and ordered the rack shown here. We have traveled over 50,000 miles with no problems. 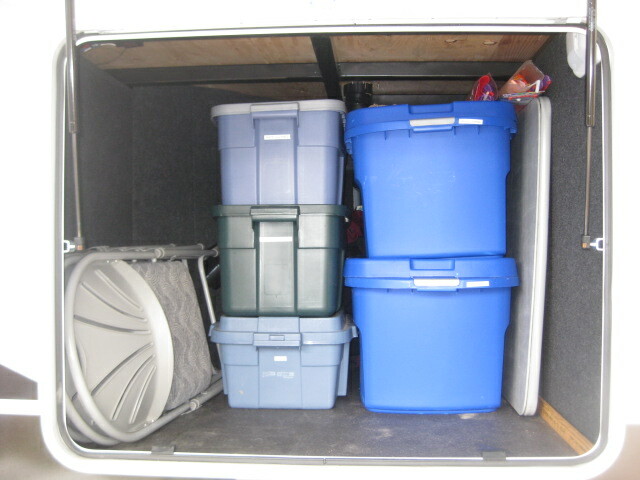 When we are hitched up and ready to go, we take advantage of all of our cargo space. Once the kayaks are on, we stow our two bicycles right behind the cab. Early on we found the bicycle frames were getting scratched from rubbing against the truck and each other, so we took some scrap material and made covers that we put of each bike, and these seems to have solved the problem. 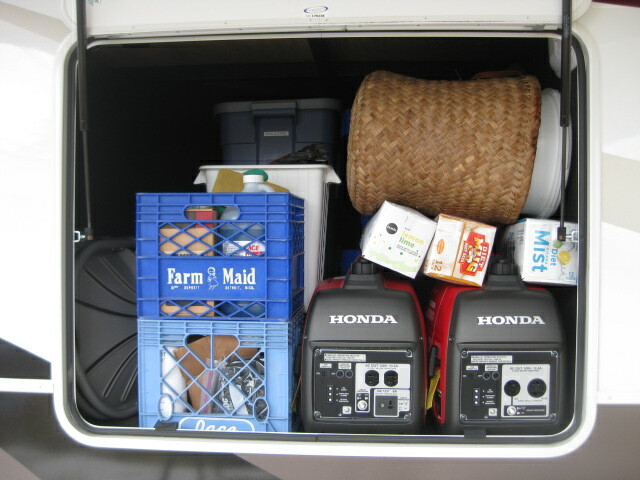 Under the wheels of the bikes go two milk crates that hold our propane tank for the grill, the regular towing hitch, and gas can. Behind the bikes is where we stow the “honey wagon” for dumping sewage when we don’t have a sewer hookup. One either side of the hitch go some sections of 2 x 8 lumber for changing tires and two lawn chairs. Finally, once the trailer is hitched up, a large plastic bin that holds our Weber Q gas grill goes between the hitch and the tailgate. We have made a number of modifications to make life easier and efficient. One simple addition was to purchase a foldout clothesline that hangs on the ladder. Most campgrounds will not allow you to hang a rope clothesline between trees because of the risk to people running into them and possible damage to the trees. This avoids that whole problem. 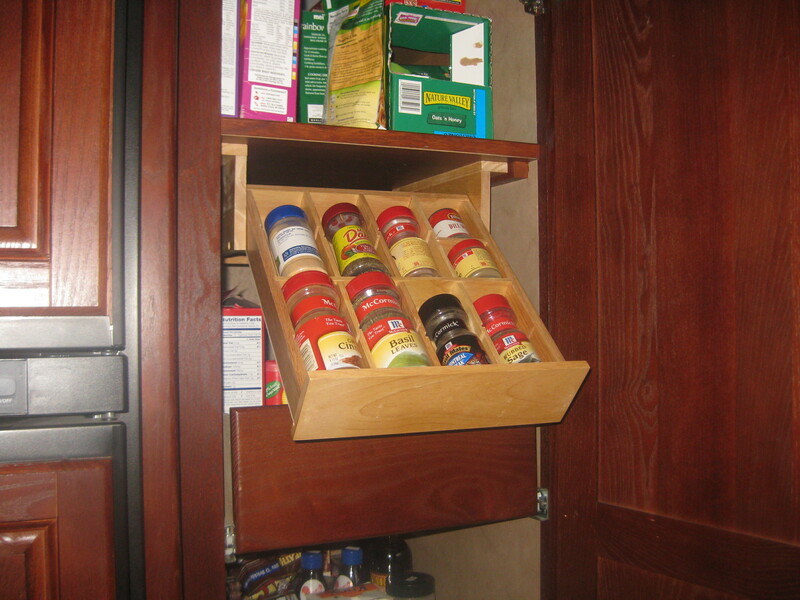 Camping World has a spice rack that fit under one of the shelves in the pantry and makes it easier to store and find spices when you need them. 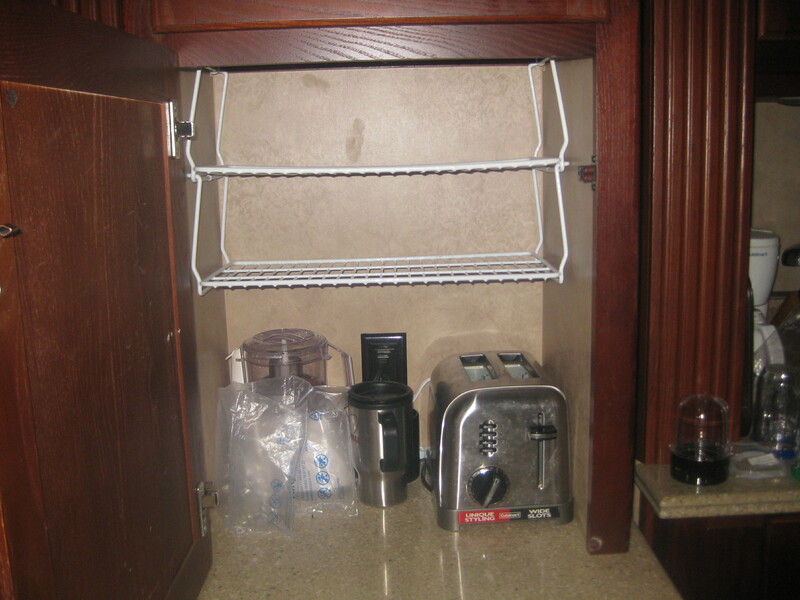 Our Cameo has what is called the “appliance garage” that is a cabinet with an outlet for your toaster, coffee maker, etc. 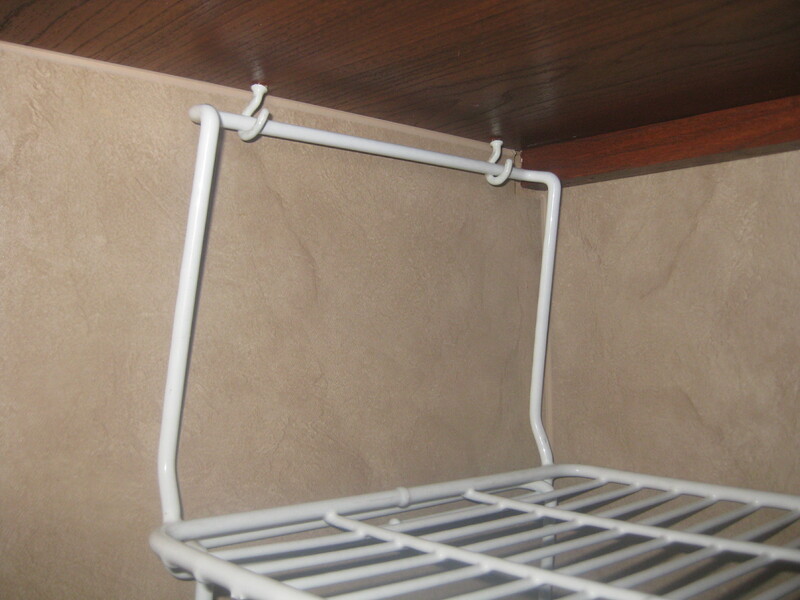 The height of the bottom shelf caused a lot of wasted space so Bob bought a couple a plate racks and hung one upside down with cup hooks and the second one just attached to the first. The simple fix eliminated some clutter and made a more usable space. 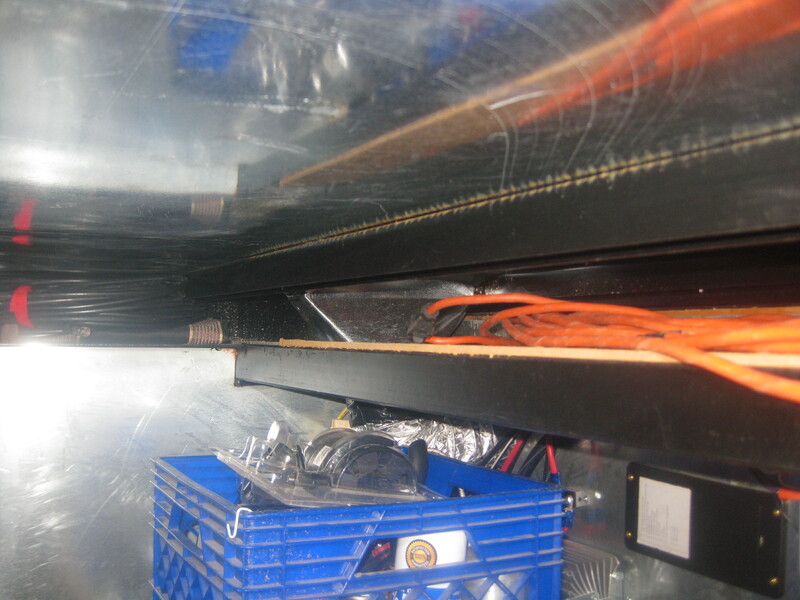 In the “garage” there are horizontal steel supports that are part of the trailer’s frame. 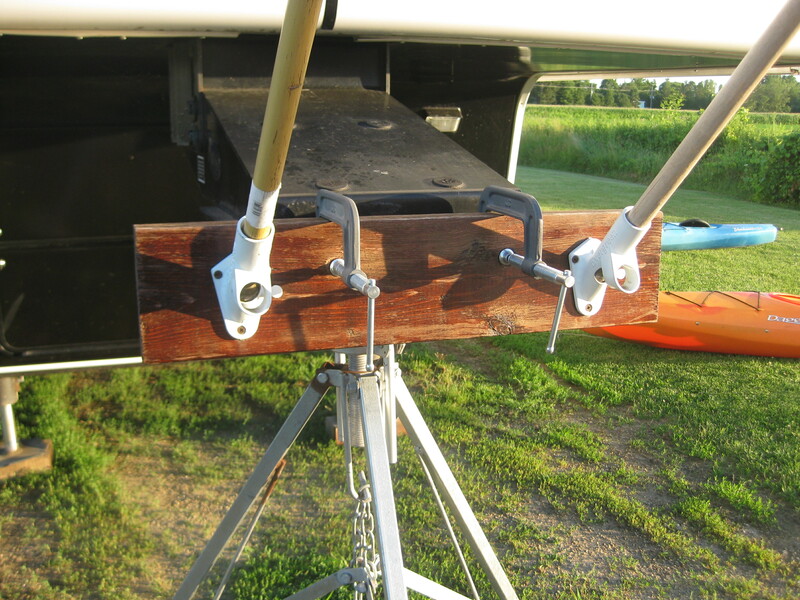 Bob built a shelf from scrap 1″ x 2″ lumber and plywood that rests on these supports and store all of his tools there. 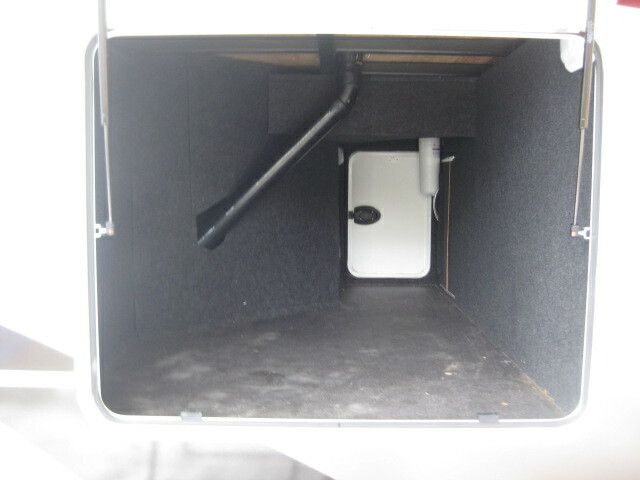 This makes them more accessible without having to dig through a pile on the floor of the compartment. He also slid a sheet of pegboard over some other supports above this shelf to create a skinny shelf to store extension cords. We buy small water filters to use whenever we are filling our freshwater tanks and these come with a short extension. Bob added one of these to each of the hose connections in the “control center” to make it easier to attach hoses without having to reach so deep into the compartment. 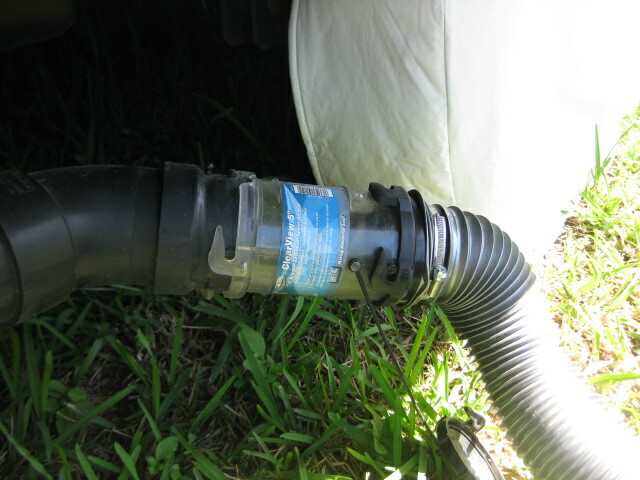 We also have quick connectors on these hoses making it easier to attach hoses for water or the San-T-Flush system. It’s also a good idea to add a clear section on your waste line to see when dumping the waste tank is finished. Bob wanted a way to display our flags but didn’t want to drill holes in the side of the trailer. Our solution was to mount them on the hitch kingpin. 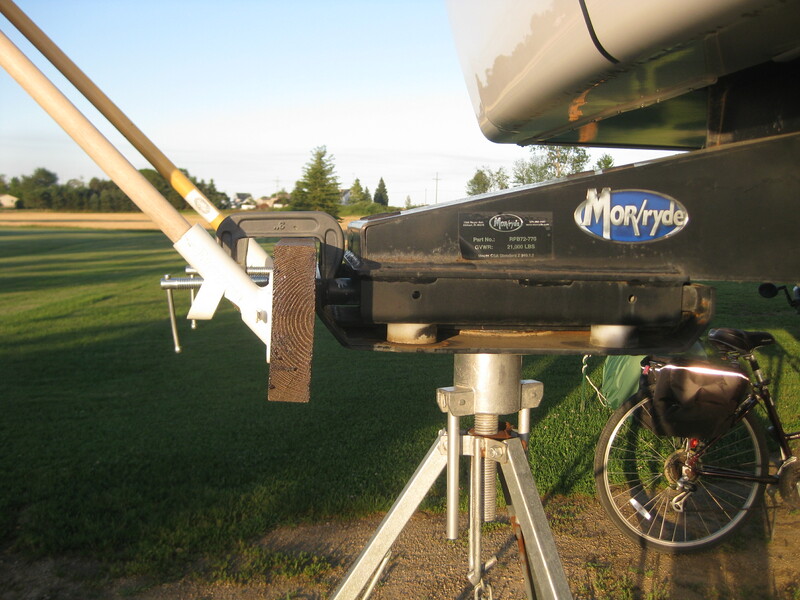 The Mor/ryde kingpin has a lip on the front, so Bob attached the flag mounts to a piece of 2 X 8 lumber and fastened that piece to the kingpin with C-clamps. This is really a great post. Lots of detail and pictures! Thanks Colin, we’re just trying to share our story with family and friends and those who may want to take the fulltime RV journey. I like the spot in the back of the truck for your bikes. I’ve been worried about hanging them on the back of the trailer. We plan to purchase our first fifth wheel in early next spring. Think I’ll follow the example for now, and put the bikes in the truck. I’m off to start reading your blog. I thought about hanging them on the ladder, but the ladder can only take so much stress. 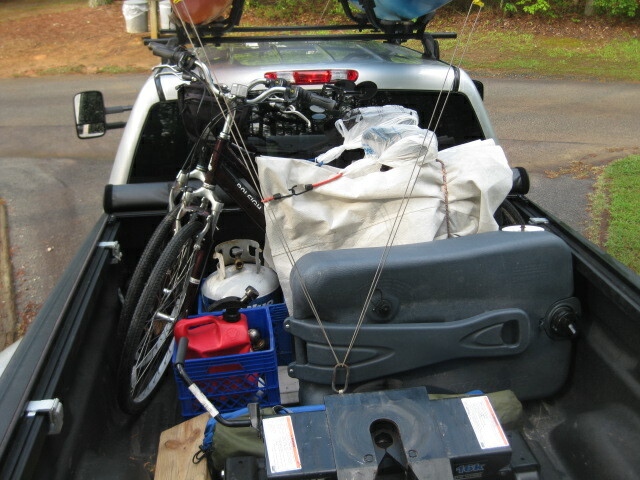 Plus this puts the weight of the bikes in the truck, not the trailer. I cover the bikes with a piece of an old trailer cover to avoid metal to metal contact and the scratches that result from that. I’m glad we were able to help you out, that’s one of the reasons we do this blog. Safe travels! Yes we are going to Sigsbee. I have to wait till Aug 8th to call because that will be 180 days out. This will be our first trip to Sigsbee and can’t wait. Planning on spending 60 – 90 days. I will definitely get in touch when we head north and maybee we can meet up.